L'il Dee's Crafting with a Kitten: Olympic Fever! As you can imagine the last week in Vancouver has been all about the Olympics. I have been so busy watching the games that I haven’t spent much time in my craft room. I did make a few cards for Valentine’s Day. Most of them have been on the blog already. Here is another I made using the new Webster’s pages we got in at Scrap Arts a couple of weeks ago. Same idea as the last one the hot air balloon was cut out of another sheet of Webster’s paper, I then used Versa mark ink and clear embossing powder on it. I used a swirl stamp to add some more detail to the corners. 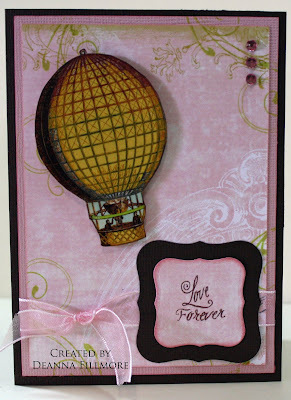 The Love & Forever stamps are from Crafty Secrets Cherish set.